How do I even begin with this......? 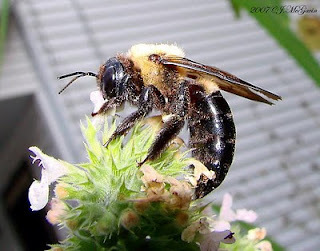 Ok I've been seeing 3 bees that resemble a "Carpenter Bee" in coloration/patterning and "size". There was a 4th bee but I've already ID'd that one. Megachile sculpturalis. Giant Resin Bee. So that's over and done with. Now the three other ones I'm seeing.......1 is Bombus impatiens (in the beginning I thought it was Bombus pennsylvanicus but I think that was a bout of insanity on that one) the other is definitely Xylocopa (shiny abdomen and HUGE) and the other is what's stumping me. It looks like a smaller (bigger then a honey bee, about the size of Melissoides bimaculata give or take a few) B. impatiens. Is this the male? It definitely is not a Carpenter Bee. So what the hell is it? Male Bombus impatiens?? But why are they pollinating flowers then? Male bees DO NOT have pollen baskets. They're main purpose in life is to bang the queen and die. What they do after screwing Your Majesty depends on the species but they all die sooner or later. So WTF is going on here? HELP! I'm going to try and get back to the park ASAP and have a look at the smaller ones. A good good look. Idk if the subspecies occurs here but I wouldn't be surprised if it did. They all look alike to me. X_X Must train my eyes better. More then certain on this one as B. pennsylvanicus has a "form" (Have to look into this more to know exactly what this is) that I don't see here at all. This is the one that making me go nuts. X_X It has fuzz on it's abdomen so I guess that rules out Xylocopa.......sooo then Bombus sp.? Male B. impatiens? WHAT IS IT? !